Mariam is a singer-songwriter and self taught guitarist hailing from South London. 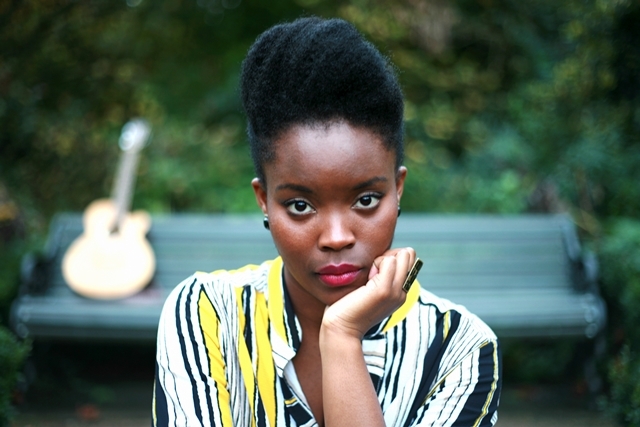 Described as ‘atmospheric soul’, her music is the perfect blend of soul, folk and pop with thought provoking lyrics. Mariam has always had a strong passion for words, writing poetry and creative pieces at a young age. She was quick to understand that she had a natural gift to combine rhythmic melodies with meaningful words, an ability she credits to her Nigerian heritage. In 2011, Mariam decided it was finally time to share her music with the world and introduce herself as a singer/songwriter. She got well acquainted with the underground scene and started playing open mic nights. These experiences turned into opportunities and Mariam joined the ‘London Community Gospel Choir‘ (who has supported artist such as Tom Jones, Sam Smith and more) and started working on original material with local artists (including British artist Samm Henshaw). The soulful singer/songwriter is now proud and ready to share her debut EP; a mature piece of work full of vocal grit and depth. Mariam managed to find the right balance between vulnerability and strength without losing her unique soulful sound that is her own. Mariam adds ‘The EP was birthed out of a heart to heart that myself and the producer had on our first session. I shared about my disappointment of my initial EP not working out, the highs and lows of being a solo artist and just about life.This is my way of bringing everyone in on that conversation, it is the fruit of it and something I am proud to share.’ Her debut EP ‘Heart To Heart’ is now available on all digital platforms. Thanks for your time! Now that 2016 is over, what are some words you would use to describe the year? What have been some of the highlights for you and your music? What are you most excited about for 2017? Highlight has been releasing my EP and my launch night, it was honestly a dream come true, for 2017 I’m excited to make more music and perform. No I didn’t. I actually wanted to be an artist because I loved drawing. (Laughter) I have always been creative. I think early memories would be watching my big sister sing and perform, she was amazing and it inspired me loads. Let’s talk about your latest song “Be There For Me.” Where did the inspiration for this single come from? That song came about from talking about some friendships that weren’t working out and just about how i was feeling about the whole situation. What was it like finally releasing your debut EP, “Heart to Heart”? How long did it take to put it together? It was a great feeling, I have wanted to release an EP for a long time, so to have it finally done was amazing for me. Heart to Heart took about a month to do, it was such a smooth process and was lots of fun. Can you talk about how your Nigerian influence is shown/heard in your music? It inspires my songwriting, in the stories i create with my songs and i’d say the pulse, and the rhythm of the songs too. I haven’t been surprised as I have been prepared and had many people tell me what it’s like, the good and the bad, biggest challenge has been making sure i enjoy the journey and remember i do this because I love music, it’s very easy to get caught up in other things and forget the reason why you do it. I think what has come naturally to me is just being able to relate to people and to connect, which I love doing. So many, there is great music out there, old and new, I love old school soul music as a whole, now artists like Emeli Sande, Solange, Kwabs, so many. I would love to work with Solange, been a fan of her work for awhile now and it is amazing. Chilling at home, listening to music or playing my guitar, spending time with family and friends and food! I hope that listeners feel, related to, welcomed and encouraged, I love to have a message in every song and hope that it just makes people feel even for a few minutes that they are not alone, that is what Heart to heart is all about. That I hope they enjoy the music, and there is loads more to come!